NEW! Open a virtual copy now, click here! Square Root of Margaret set to release WYSiWYG at Phog on Friday October 15! 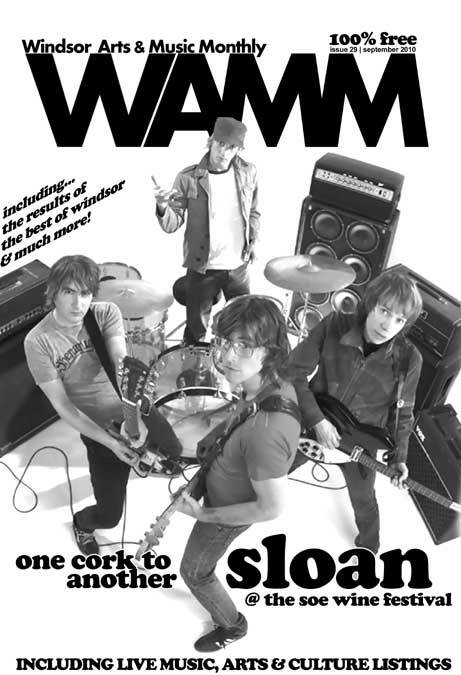 the August 2010 issue of WAMM has been out for ages, but now it is online too! issue 26 | june 2010 is out today! CD REVIEW: Evelyn Falls "Dirty Girl"
EVENT PREVIEW: Indie Showcases at The FM Lounge, starting tonight! CD REVIEW: Vultures! "...The Very Best Of"
Copyright © 2009 Windsor Arts & Music Monthly (WAMM). All Rights Reserved. No part of WAMM magazine in print or online may be reproduced in full or part in any way without the written permission of the editor. Website maintained by WAMM.media 2008-09 c/o Stephen Hargreaves. · WAMM (Windsor Arts & Music Monthly) on the web!